For the next 7 days, leading up to the start of Bills Training Camp, Buffalo Sports Page will ask and answer the ten biggest questions facing the team in 2018. 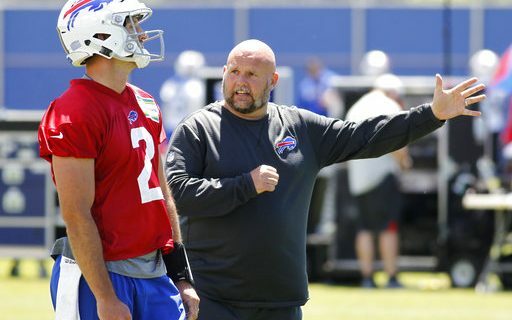 When Brian Daboll arrives at St. John Fisher in suburban Rochester for his first day of training camp at the Bills’ new offensive coordinator, he’ll take his first in-person look at his team. He will see A.J. McCarron, signed as a free agent after throwing a total of 133 passes in four years in the NFL. That’s a month for Drew Brees. He’ll see Nathan Peterman, who went 1-1 in two starts as a rookie last season. And he’ll see Josh Allen, the team’s first draft choice in the spring who has plenty of physical tools but is not considered someone ready to step right in to an NFL starting lineup. But he won’t see last year’s starter, Tyrod Taylor, who was traded to Cleveland. Daboll will see LeSean McCoy, the team’s best offensive player but who is under investigation for an off-field incident. McCoy’s immediate future is, at the least, a little cloudy for the time being. He will see a group of wide receivers led by Kelvin Benjamin and Zay Jones (someone with his own off-field incident), with not much experience behind it. And he’ll see an offensive line missing its two best players from last season, Eric Wood and Richie Incognito. Welcome back to Buffalo, Brian (he was born in Welland, Ontario, and played high school ball at St. Francis). Sorry we’d didn’t have more presents for you. Daboll replaces Rick Dennison. The Bills’ offense wasn’t too good in 2017, finishing 22nd in points, 29th in yards and 31st in passing yards. That’s not good news, although it could be argued that no coach and/or system could have done more with that roster. The names have changed a bit from 2017, but it’s tough to say that the changes are for the better – at least for the moment. With three new quarterbacks on the roster, it’s actually not the worst possible time to have a new offensive coordinator. All of them would have to learn an NFL system anyway. What will we see out of the offense? Daboll seems to be the type of coach who is in driven by matchups. He wants to put his players in a position to make plays, such as having McCoy in a spot where he has to be defended by a linebacker. Therefore, you can expect to see players in unusual positions when the ball is snapped. The philosophy will follow the example of the New England Patriots, where Daboll was an assistant for several seasons. He has plenty of other experience, and will do most of the play-calling this season. Daboll has been a part of the coaching staff of New England’s Bill Belichick, arguably the best pro coach in the business, and of Alabama’s Nick Saban, arguably the best college coach in the business. Can he improve the performance of an offense that, in terms of personnel, looks weaker than the squad that finished the 2017 season – while developing Allen in the process? It’s a tall order. We’ll start to find out the answer next week.